A királynö, The Queen, La Reina. To me, she is a true Queen, one who’s valued in real life. She typically looks like a so called “királynö” (kie-raalj-neu)(Queen-woman), amidst her daughters Kati, Margit, Erzsi en Zsuzsa. Of course she is named Ilonka. I’ve named them myself, as it’s more convenient than mentioning ‘the second from right or the youngest’. As a matter of fact, while painting this picture, the characters really came to life to me. I guess, the mother would have been about 130 years old by now, and her offspring more than 100 years of age. The painting is based on a picture taken in around 1910-1915. It shows a Hungarian Family who were about to immigrate to America. Photographer Frank Shepard selected them from the masses of refugees arriving at Ellis Island, to make a remarkable picture. Franks’ photographs were meant to document and serve identifying ‘Eligibility’ for entering the Unites States of America. This method was actually based on the theories of Phrenology. Is was not meant to be an artistic impression of refugees arriving in New York, but actually a picture to value and select individuals. On the contrary, these kind of pictures were base on a despicable theory. As a modern artist, I’ve tried to return this family their dignity as they deserve; as sincere individual without judgment of origin, religion or political sympathies. At the end, it has become a psychological painting with multiple layers of messages. First of all, every person in this painting is shown with their typical personal character, sometimes exaggerating the original picture. Therefor, it’s no exact copy of the photograph. Second, the colors in this painting do not resemble the original, even the taints of their faces and hands I’ve chosen myself. As they have been peasants, I even strengthened the roughness of their hands. My Hungarian mother in law has mentioned that the clothing of the girls seem to be “travelling clothes ” which tends to be strong, thick and warm, traditionally worn by country peasants. The more smoothened variant of this piece, was more common worn by wealthy people in Hungary in those times. I’ve painted this piece of clothing as rough as possible, while Zsuzsa was painted with a different color of her dress, also due to the composition in the picture. The shoes, I had to invent myself, as the photograph only shows a black spot, due to bad lighting, I guess. I’m convinced they must have looked like this with thick woven socks. The little Erzsi seems to be the little crook in the family as she standing there with crossed fingers, one rare shoe and a challenging look in her eyes. She seems to be the most optimistic of all and enforces their luck. Zsuzsa is most scared of all, as her position signals fear, with her legs forcedly held together. Like her mother, Kati is strong and powerful as a strong tree in the earth, with both her feet solid on the ground. This is where I started the painting; with dedication and focus what to do and how to approach the challenges in this remarkable painting. Her character is deliberately painted grey and fatigued, as she has been responsible for her family during the long journey to Ellis Island. Margit is surprisingly exploring the scene and looks anxious to all the new things around. 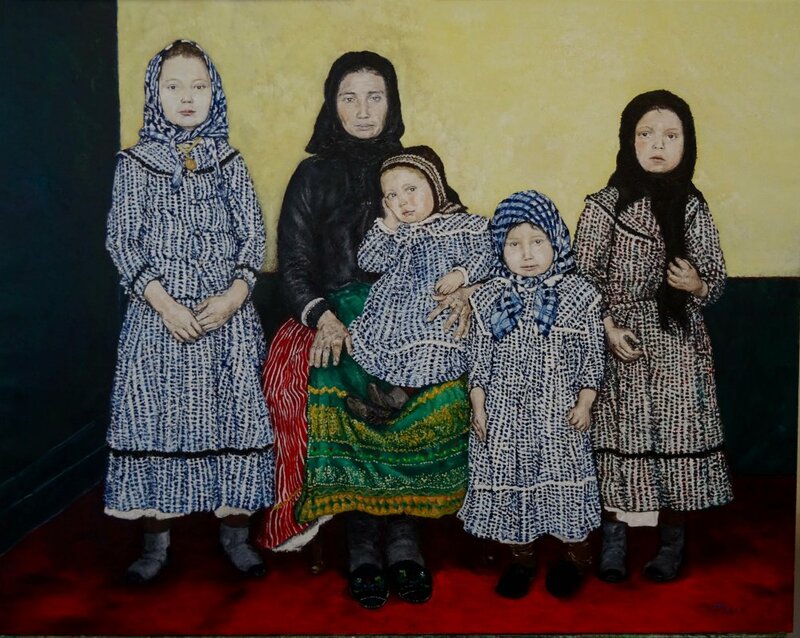 Ilonka, Ilonka néni, is firmly holding her and in this painting looks at her future with a modest smile. Although she’s still young, life has worn her out a little already. Her hands are rough as she’s been working on the land for multiple years. Her face is grim due to worries and fears of all unknown challenges in the land of promise, ‘Amerika’. Her clothing is traditional and beautiful, but worn and simple as well. This is a deliberate choice from me as painter, for an extensive knitting-wear would not fit with the torn edges of her dress. Even a thread is hanging down.